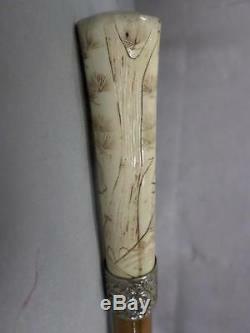 Antique Asian carved cane w/ silver collar, bovine bone top & signed bamboo shaft. 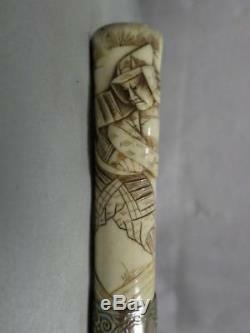 Intruiging Asian/ Oriental cane Bovine bone top with carved three dimentional warrior figure. 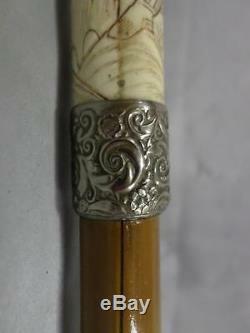 Un-marked continental silver collar with floral design and embossed shield. 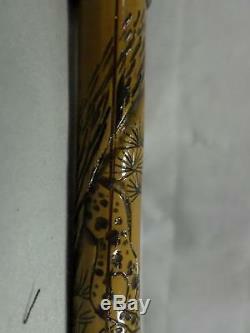 Thick Sandy coloured bamboo cane carved and detailed with a'wood burning' technique. 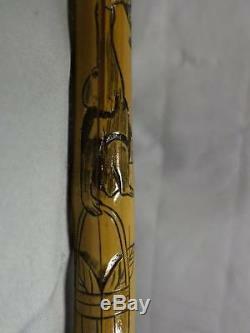 The cane imagery is made up of some tree branches, monkeys (that appears to be stealing a basket) and a woman in traditional dress. 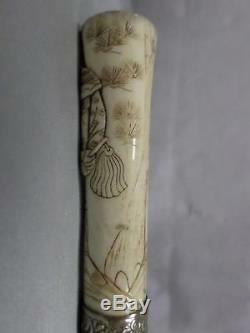 Below the imagery is the signature of the artist. 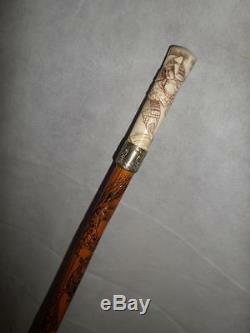 The cane is finished with a replaced bi-metal end that is fit for purpose. Age wear and mild discolouration to the bovine bone top with mild chipping. 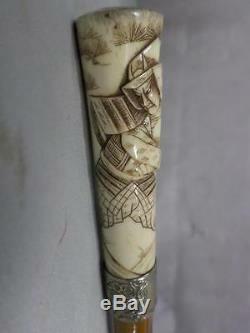 Collar is good used condition with only mild surface wear. 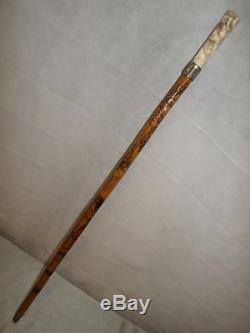 The bambo cane shaft does have some splitting, chipping and general wear. 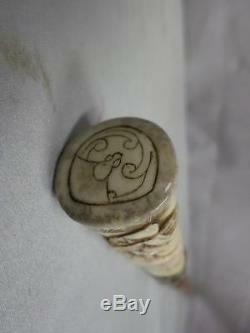 The splitts have been mended/filled for cosmetic purposes and additional strength. 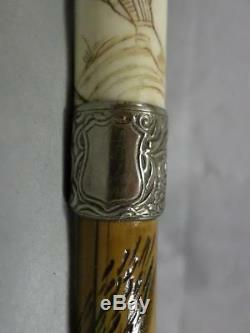 The end has been previously replaced and is in good used condition suitable for use. Packaging We pride ourselves on packing our items securely and efficiently whilst recycling as many clean materials as possible. Our feedback profile boasts the skills of our hardworking packing departement. Excludes very large and very heavy items i. Feedback We take great pride in our previous feedback and do our best to reply to each feedback left. Item Description Great effort is taken to ensure items are listed truthfully and correctly, unfortunately as humans mistakes are sometimes made. We would be happy to assist in any way possible. Show off your items with Auctiva's Listing Templates. 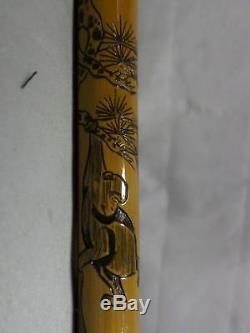 The item "Antique Asian carved cane with silver collar, signed bamboo shaft" is in sale since Thursday, December 8, 2016.